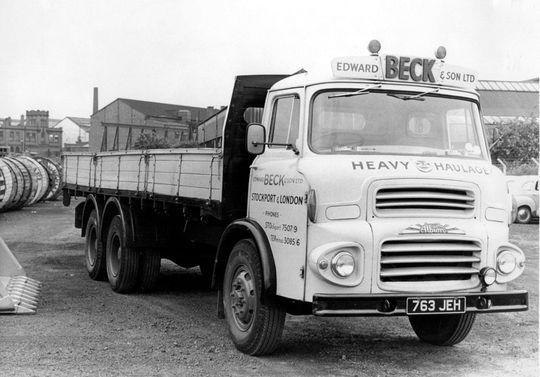 As well as operating an ERF, Foden and Scammell dominated fleet Edward Beck & Son Ltd also ran a variety of other makes of vehicle including AEC Matadors, Albion, Atkinson, Bedford, BMC, Commer, Dodge, Ford, Leyland, Maudslay and Seddon. This page contains a selection of photographs depicting the other various makes of vehicle in the fleet. 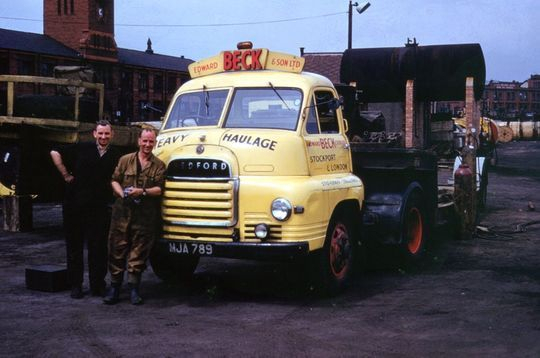 This ex military AEC Matador was one of six originally used by Contractors (Manchester) Ltd for transporting the company's own plant and equipment. Seen here in 1952 now on the Contractors (Transport) Ltd fleet, it is loaded with drilling equipment from the Oilwell Engineering Co Ltd at Cheadle Heath Stockport. Maudslay 'Maharanee' 4x2 13-ton tractor unit Reg No EUK 616 is seen here in 1956 outside the premises of Arthur Lloyd & Sons Ltd which was located on Marsland Street in Hazel Grove. Registered new in 1947 it was one of several in the fleet at that time with this particular one being purchased second hand from the BRS depot at Pleck Road Walsall after deregulation. 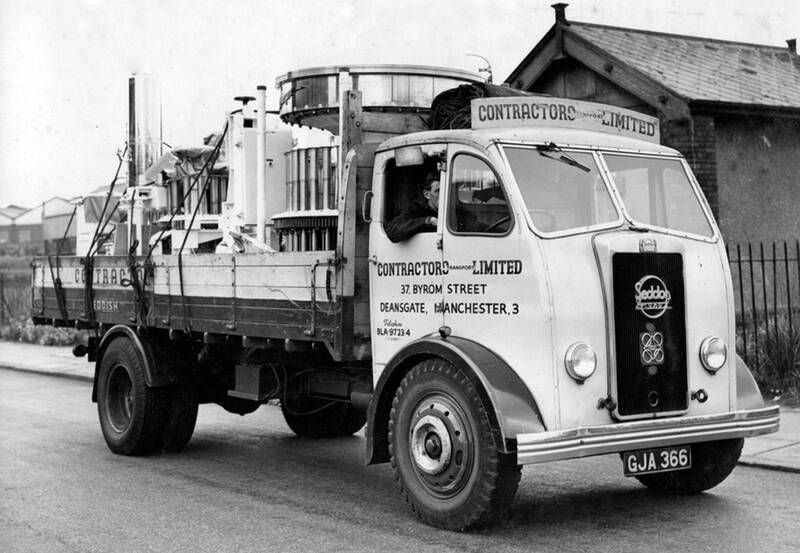 Seddon Diesel four wheeler Reg No GJA 366 ran in the livery of 'Contractors (Transport) Ltd' which was one of Edward Beck's originally owned companies that concentrated on heavy haulage. 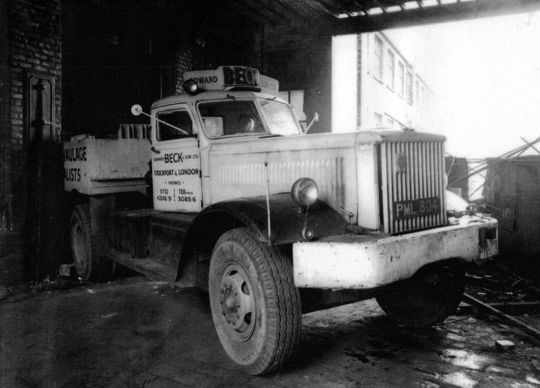 New in 1953 it is seen here in 1955 while parked on Greg Street in Stockport and was one of the very few vehicles in the fleet that had the address of the company's clearing house on the door, which for a time, was located on Byrom Street Manchester. This office later closed when all operations were transferred to the much larger Greg Street site in Stockport. Three of a kind ready for the road in 1956. Pictured parked on Greg Street adjacent to the depot in Stockport, is Maudslay Maharanee ,tractor unit Reg No EUK 616 followed by ERF 4x2 tractor unit Reg No FOV 852 with S-Type Bedford 4x2 tractor unit Reg No JJA 945 bringing up the rear. Registered new in 1957 S-Type Bedford 4x2 tractor unit Reg No MJA 789 is pictured here in the depot at Greg Street Stockport when three years old in 1960. Standing on the left is mechanic Stan Barker, who would later go on to be the company's service manager, while on the right is one of Beck's long time serving drivers Jack Bradshaw. Another shot of S-Type Bedford 4x2 tractor unit Reg No MJA 789 as it shares a parking spot with a couple of coaches. They came over here during the war as tank transporters and they never went home! Registered for UK use this ex U.S. Army Diamond 'T' 6X4 prime mover was allocated Reg No PML 804. 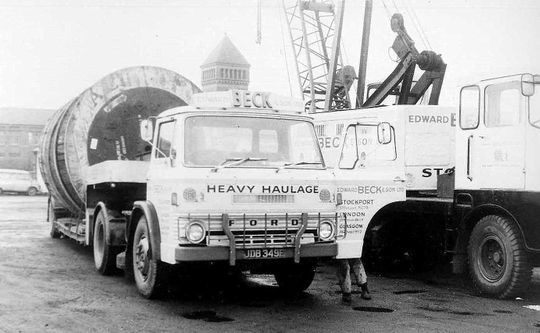 It is seen here in 1954 shortly before it received it's Edward Beck livery and was one of several Diamond 'T's in the fleet at that time. 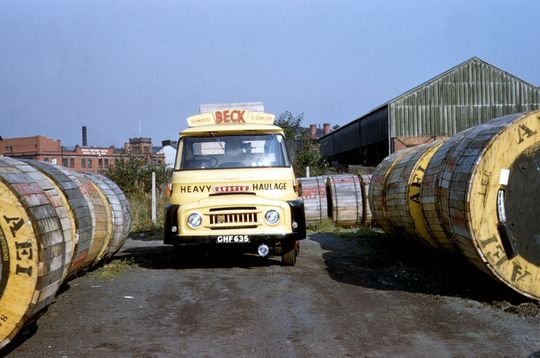 This particular one had a long life at Beck's and was utilised in the fleet for many years were as the others were only used briefly before they were sold on. Driven by James Etchells, who can be seen in the cab, Diamond 'T' 6X4 prime mover is pictured in the depot at Greg Street Stockport after being painted up into Edward Beck & Son Ltd livery. 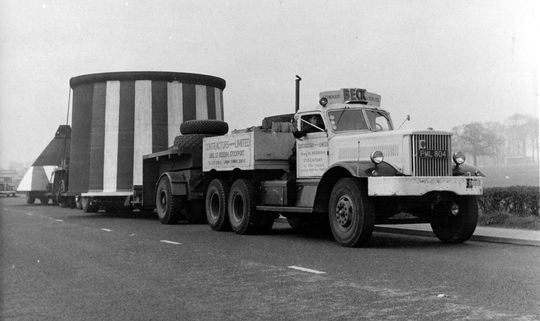 Originally designed and built in Chicago Illinois as a tank transporter tractor ex U.S. Army Diamond 'T' 6X4 prime mover Reg No PML 804 is pictured here in 1959 while on the A64 near York. PML 804 was driven on a regular basis by long time serving Beck's driver James Etchells. 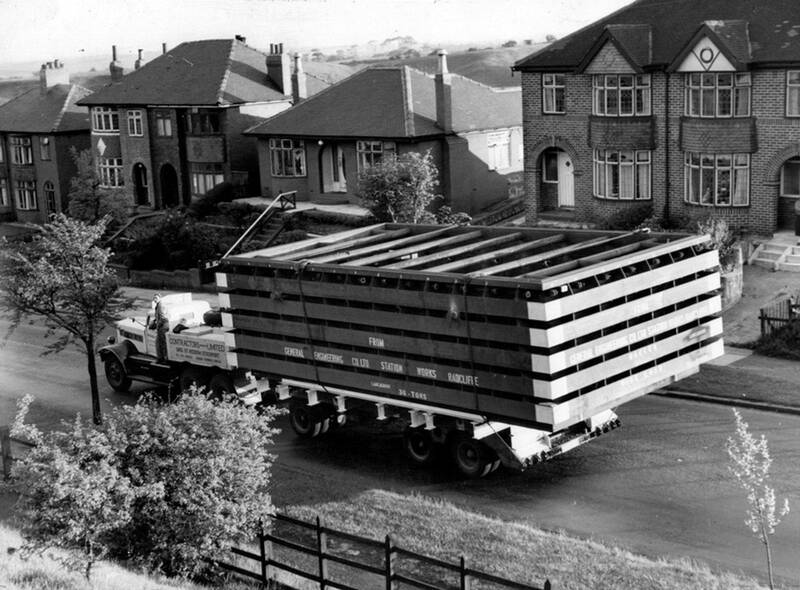 Diamond 'T' 6X4 prime mover Reg No PML 804 is seen here again in action this time transporting a wide load on behalf of the General Engineering Co Ltd Radcliffe. 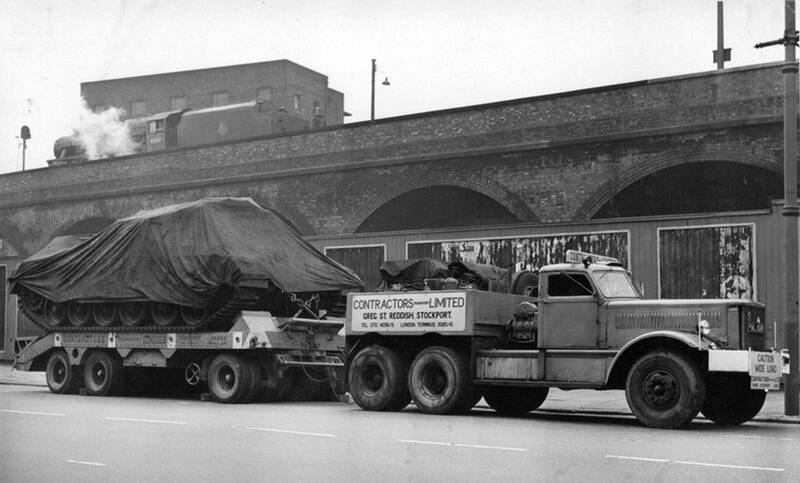 1960 registered Austin BMC 504 4X2 tractor unit Reg No GHF 635 is seen here coupled up to a low-loader. 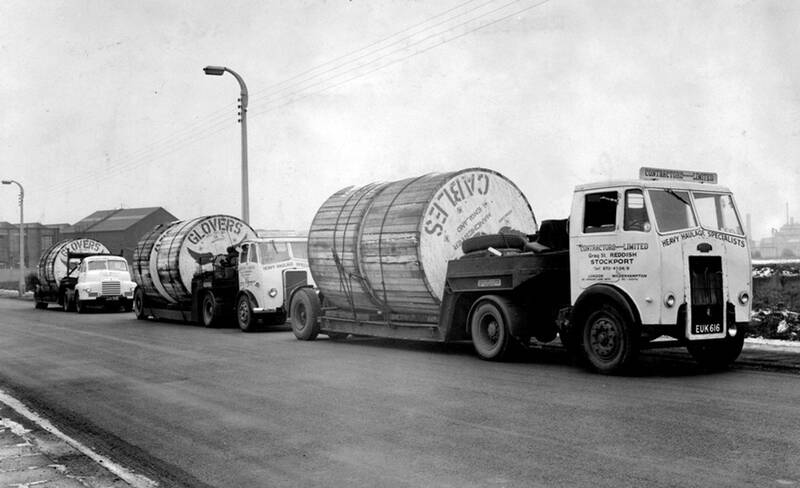 It is loaded with drums of high voltage electric cable collected from the AEI manufacturing plant at Gravesend. 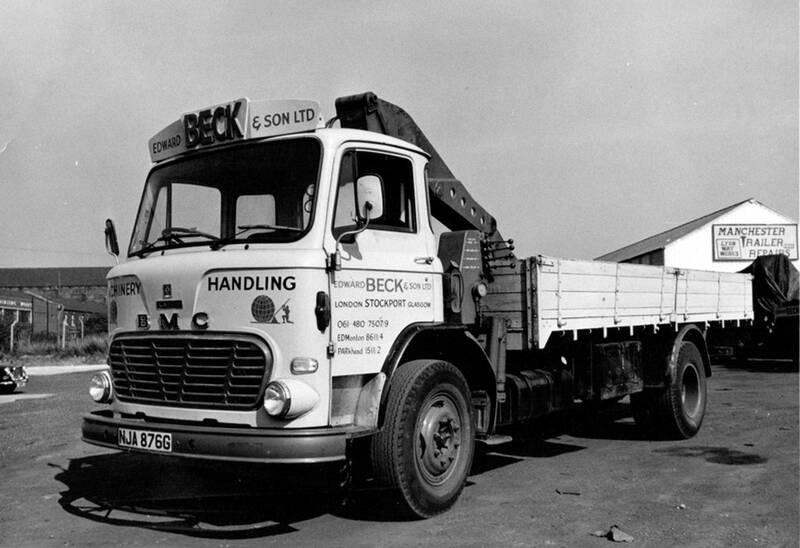 A nice colour shot taken in 1967 of 1960 registered Austin BMC 504 4X2 tractor unit Reg No GHF 635. It is parked up between drums of high voltage electric cable of which there were hundreds stored on site at that time. 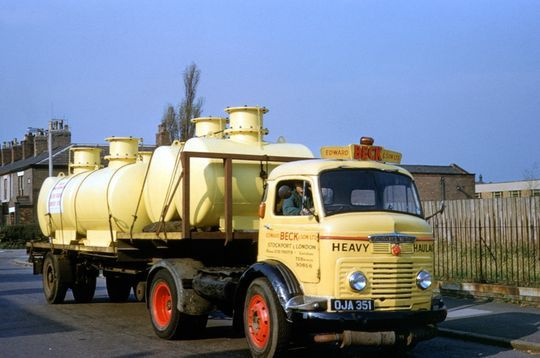 New in 1958 Commer QX TS3 4x2 tractor unit Reg No OJA 351, driven on a regular basis by Vernon Russell Macro, was one of three Commer TS3's operated by the company during the late 1950's and early 1960's. Powered by a Rootes two-stroke compression-ignition diesel engine with uniflow-ported cylinders these engines gained a reputation for good performance although the quill shaft was somewhat prone to breaking if over-worked. The engine's distinctive exhaust bark was always apparent, leading to their popular name of 'Knockers'. 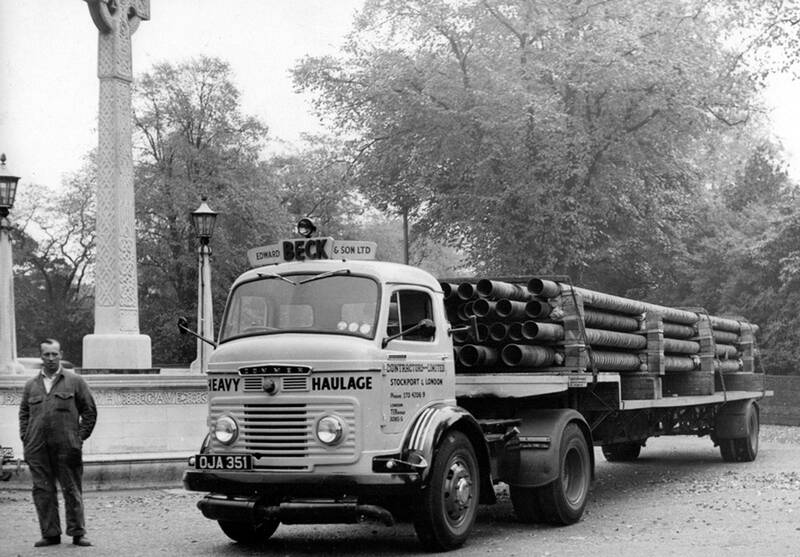 Driver Vernon Russell Macro takes time out for a photograph alongside Commer QX TS3 4x2 tractor unit Reg No OJA 351. 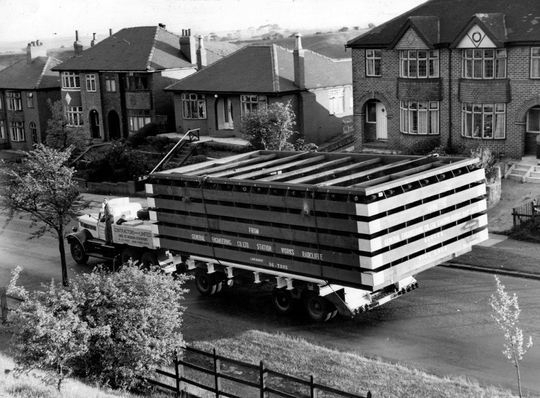 Pictured in Bowden near Altrincham it is coupled to a single axle semi low-loader with a full load of gas pipes on board. Pictured here in 1961 is another Commer QX TS3 4x2 tractor unit Reg No PJA 878 which was one of three Commer TS3's operated by the company during the late 1950's and early 1960's. 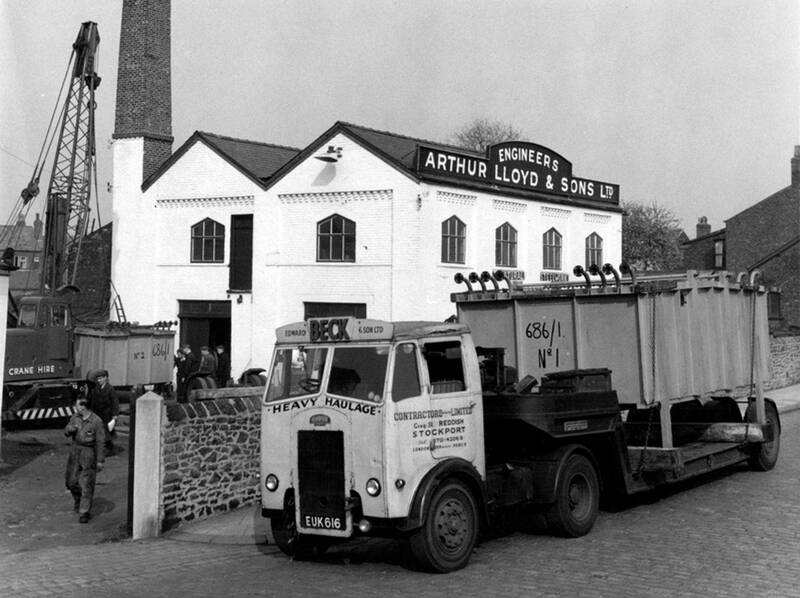 Commer QX TS3 4x2 tractor unit Reg No PJA 878 is seen here in 1959 hauling a low-loader outside the premises of Wharton Crane & Hoist Co Ltd in Reddish. 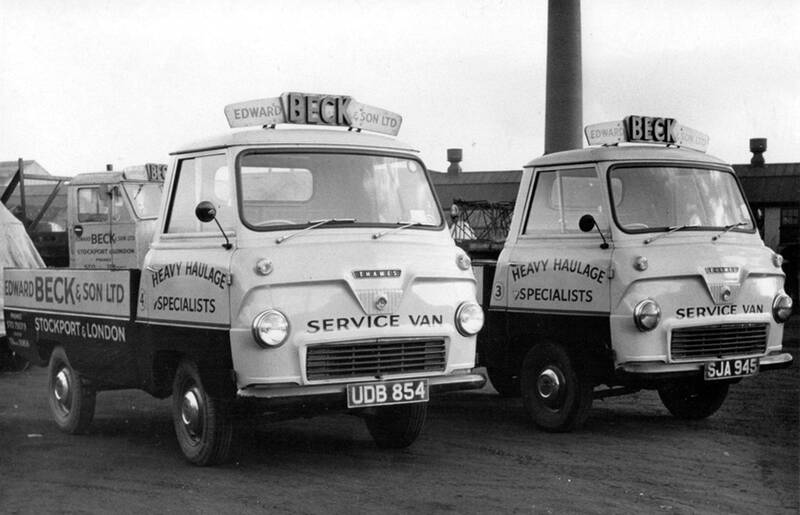 The Beck's Thames Trader on the left is an early model with an external sun visor. An unidentified Commer QX TS3 is pictured here at the National Tramway Museum at Crich in Derbyshire. 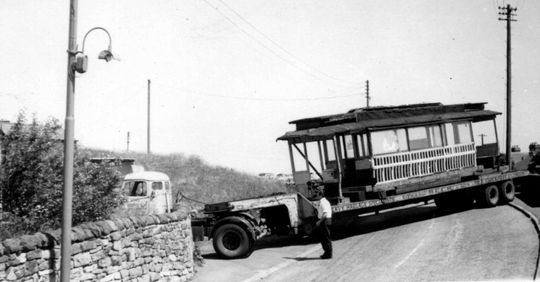 The load is Manchester Tram No 765 which had been originally delivered to Crich on the 20th of June 1960. The picture above was taken some three years later on the 20th of July 1963 after the tram had undergone some work and was leaving Crich to go back to Stretford, Manchester for restoration. Drivers mate, the late Walter Wilson, look on as the driver reverses the trailer out of the entrance of Crich Tramway Museum before the journey back to Manchester. 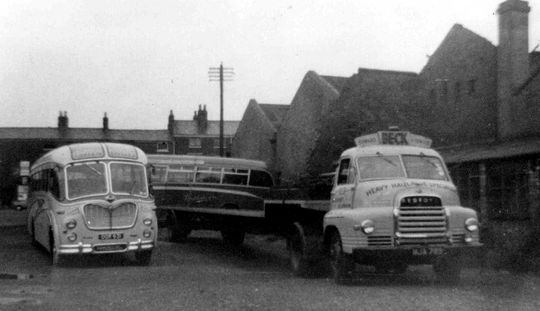 Parked in the depot at Greg Street Stockport in 1962, when new, are a pair of Ford Thames 400E 15 cwt service vans Reg Nos UBB 854 and SJA 945. Powered by a Perkins 4/99 diesel engine these little vehicles were used for a variety of things including local breakdowns or tyre changes. 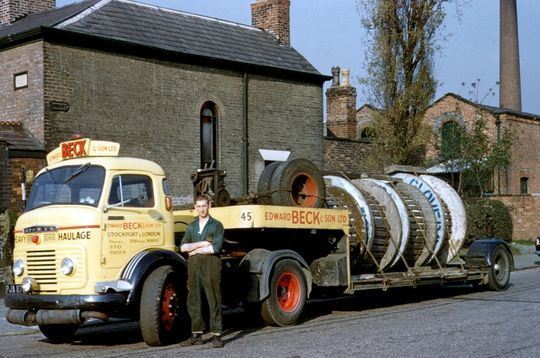 Taken on Salford Docks in 1967 this is thought to be the only colour shot of an Edward Beck Atkinson 4X2 tractor unit. It is pictured leaving the dockside after collecting a Caterpillar dump truck imported from the USA. 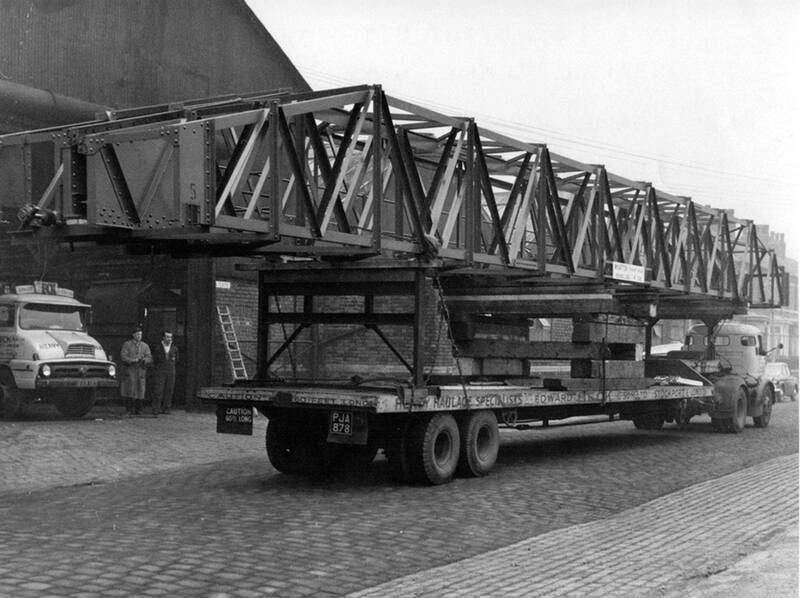 This 1962 registered Albion Reiver, Reg No 763 JEH, doubled up as a tackle wagon in support of abnormal load movements. At times it was also used for moving Caterpillar equipment and various other loads. 1967 registered Ford 'D' Series 4x2 tractor unit Reg No JDB 349F was driven from new by Ernie Smith. 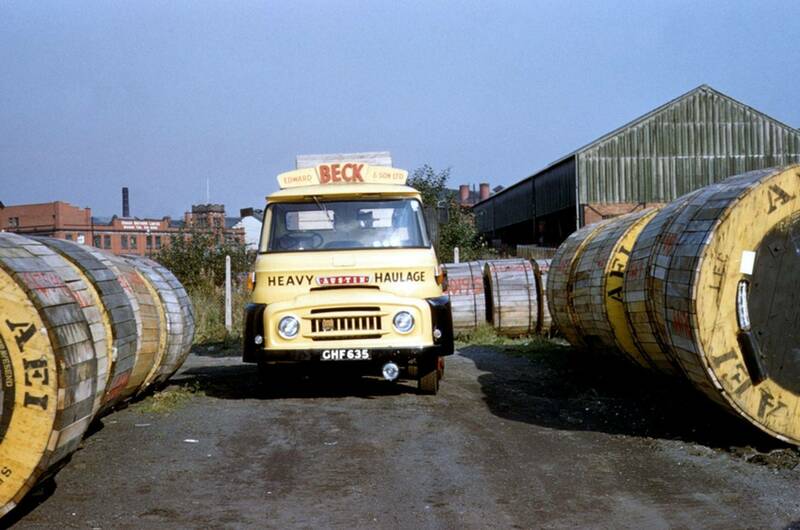 It is pictured in the depot at Greg Street loading up with empty cable drums for return to AEI in London. This and a similar vehicle, driven by Ronnie Machin, were somewhat unusual tractor unit additions to the fleet at that time, as most of the other tractors were made up mainly of ERF's and Foden's. 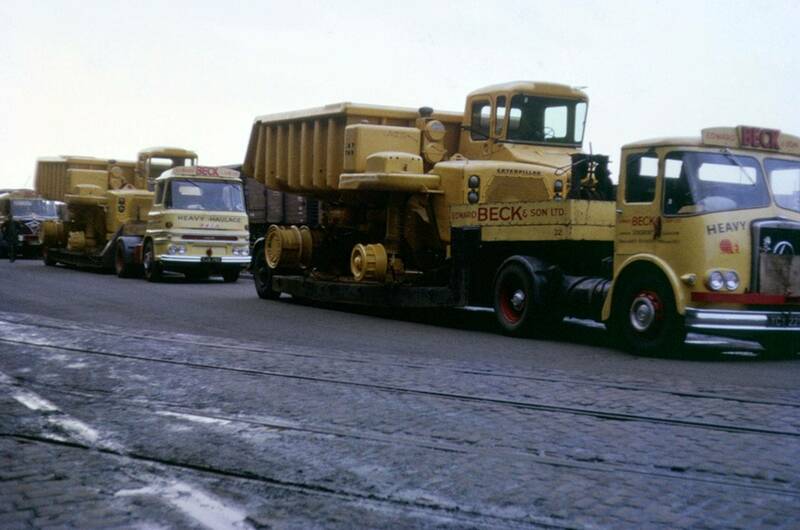 The company also ran a number of the more powerful Ford D1000's which were powered by Cummins V8 engines. 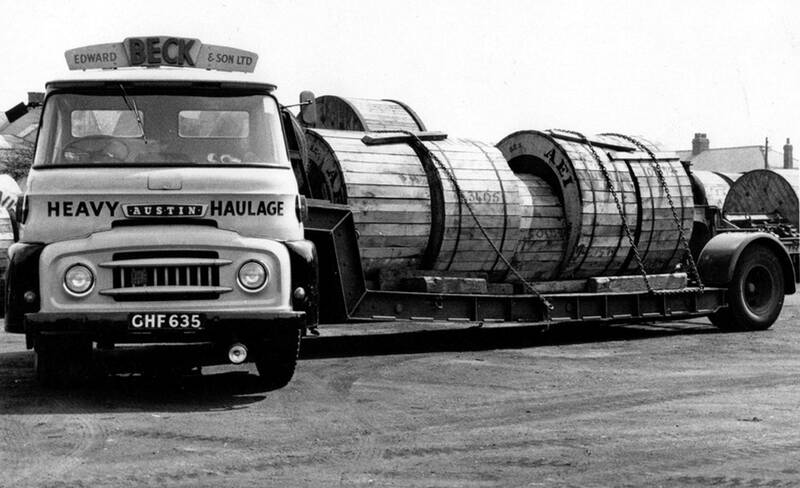 BMC Leyland Laird Tackle Wagon Reg No NJA 876G was a brand new addition to the fleet in 1968. Fitted with an Atlas Hydraulic Crane, it was used as a tackle wagon in support of the many abnormal load movements that Beck's undertook.